You’ve been entered! See you at Symitar! Come meet us at Symitar to gain a second entry to win a $250 Amazon Gift Card. Are your mobile communications secure, encrypted and private? Chances are if you are using a 3rd party mobile chat application or text messaging they aren’t. MobiConnect from Mobilearth provides protection, security, encryption and privatization of your mobile data. 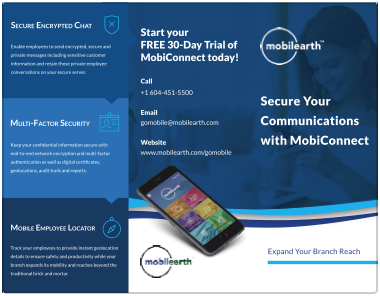 Try your own MobiConnect FREE Trial today!